Hey Nate, I keep hearing about this damn “Paleo” diet, and it reminds me of your investigation into whether what’s “natural” is “good.” Seemingly intelligent people claim that humans are in fact best suited to a diet consisting only of what a caveman would have eaten. It seems absurd to me — I mean, we’ve physically evolved since that time (pinkie toes have gotten smaller in response to wearing shoes), so how could eating grains that we’ve cultivated for 10,000 years be bad for us? Not to mention that these same people drive cars, work in buildings, etc. My response: I’m inclined to agree (with significant caveats). We know that humans have evolved a lot since the agricultural revolution. Besides the toes (which I hadn’t heard about), there have been some digestive changes. I, and most other descendants of the snarling pillaging northern European types, have a mutation that allows us to continue producing lactase into adulthood. Dairy is a really important part of my diet despite the fact that there are a lot of people who believe it’s wrong, just wrong, to be drinking mammary fluid as an adult. (If you google around a bit you’ll find lots or rants by people who are clearly replacing their milk with something more powerful…) But these people do have some right to complain, something like 70 percent of the world is lactose intolerant (see China) and yet government guidelines have been recommending a nice glass of milk a day forever. Okay – I could take that tangent pretty far – but the point is we’ve changed: People with ancestors from around the fertile crescent have more amylase in their saliva (helps break down starches). And all humans have a long small intestine and short hind gut compared to the great apes, which is consistent with a shift to higher quality foods (less leaves, more grains and meats – or maybe just more cooking). So, go ahead and thumb your nose at your paleo diet friends and dig into a sandwich. Or actually, wait – because here come the caveats. Katherine Milton, who has spent years in the jungle studying what monkeys eat (sometimes living with indigenous people) makes some of the same points you did, but also notes that it’s pretty clear that our Western diseases, or diseases of affluence (heart disease, obesity, diabetes, colon cancer) are related in some way to diet. As the unstinted flowering of the diet-book tree suggests, we really don’t understand what’s causing these afflictions. And when people do go on the paleo diet their blood sugar drops, they lose weight, and reverse their diabetes (type 2). In other words: Mock it all you want, it looks like it works. There’s a lot of science behind this and a big clinical trial going on at UCSF looking at diabetics on the diet. So how do we resolve this contradiction? 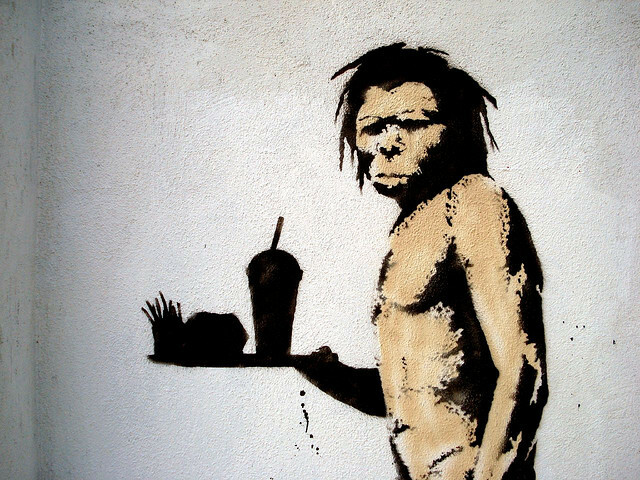 Clearly we have evolved for a more modern diet – but going back to eat like a caveman is healthier? I think it’s not that the paleo diet per se is healthier – but that just about anything is healthier. Here’s Milton from another paper: “Information on diets and health of recent and contemporary traditional peoples, both hunter-gatherers and small-scale agriculturalists who also eat wild foods, show that all such societies are largely free of the diseases of affluence, whether the daily diet is made up primarily of wild animal foods, wild plant foods, or a single cultivated starchy carbohydrate supplemented with wild plant and animal foods.” You have people who live on potatoes, people who depend on corn and beans, people up north who eat heroic amounts of saturated fat and cholesterol and almost zero veggies, you’ve got the Masai in Africa whose staple is cows milk sweetened with blood (incidentally there was a separate mutation for lactase in Africa). None of them get heart disease or diabetes on these diets with the anything near the frequency that we do (even if you just look at the cohorts over 60). Basically humans can eat anything – there’s just one culture in the world that’s hit upon a truly unhealthy diet – and that’s us. Except – it may not be unhealthy for everyone. There are probably a lot of other factors besides these enzyme mutations that make people different and some of us are probably perfectly well adapted to a sedentary lifestyle and a processed-foods diet. Been on this diet for a month. I feel better and have had little or no flares of my fibromyalgia. Before the diet I was flaring at least 3 times a week and taking prednisone which screwed up my blood sugar. My fibromyalgia only shows it's ugly head when I eat green stuff. All I know is a pure meat diet with out sugar or grain is solution. Hello again. Been on this diet for about 5 weeks. I eat lean meat mostly chicken & turkey breast, lean pork, fish & very lean beef. As for vegetables – all but potatoes & yams. Mostly leafy greens. I've have more energy and no fibromyalgia flares vs. before the diet at least 3 flares a week and taking prednisone. My blood sugar is still not stable which got out of whack from the prednisone & severe infection 2 mths ago. Tried to get into the UCSF study but it was closed so I went on the diet myself.